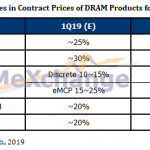 Contract price increases for NAND flash started to slow in the third quarter of 2017, ranging between zero to six percent after months of price hikes, according to DRAMeXchange, a division of TrendForce. One memory manufacturer posted a price decline. SK Hynix reported in October that the average selling prices (ASPs) for NAND flash fell three percent in the third quarter. Here’s more good news for buyers. The supply shortage will start to ease in the fourth quarter as memory manufacturers continue to ramp-up 3D NAND production capacity. As volume production of 64/72-layer 3D NAND devices ramp in the fourth quarter, prices are forecast to remain flat to up slightly in the quarter. 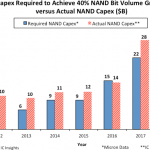 But as the 3D NAND market matures, buyers may see prices start to fall. In the meantime, NAND flash manufacturers continue on their high growth path. 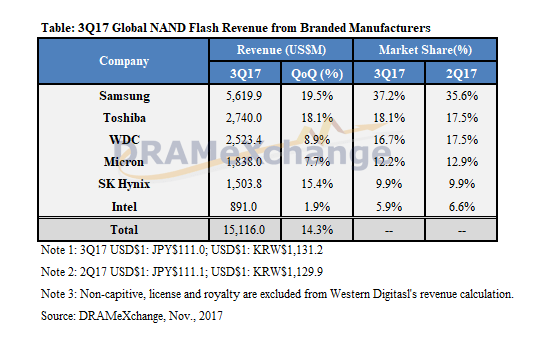 Global NAND flash revenue from branded manufacturers increased by 14.3 percent sequentially in the third quarter of 2017. 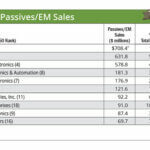 DRAMeXchange attributes the increase to rising demand for smartphones and SSDs used in servers and data centers. Demand is expected to continue during the traditional peak season, and then start to slow in the fourth quarter with the exception of demand for smartphones. SK Hynix believes mobile NAND will keep driving growth in the fourth quarter as smartphone manufacturers, particularly Chinese makers, continue to use high-density NAND and MCP. 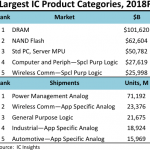 Although demand will slow heading into 2018, memory manufacturers are expected to maintain their high revenue growth in the fourth quarter due to the high prices of NAND flash. 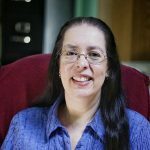 Although there is some price moderation currently, contract prices for NAND flash increased by 20 to 25 percent in the first quarter of 2017, followed by three to 10 percent price hikes in the second quarter as production capacity dropped for 2D NAND and memory makers migrated to 3D NAND. However, revenue growth may not last into 2018 as the market enters into an oversupply scenario in the first half, returning the market to its normal growth cycles. 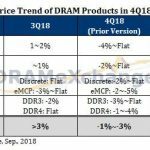 DRAMeXchange is forecasting an oversupply of NAND flash in 2018 as 64/72-layer 3D NAND development matures and the industry enters into the off season in the first half of 2018. But the oversupply may not be as significant as initially believed due to recent production capacity expansion plans by major memory manufacturers. 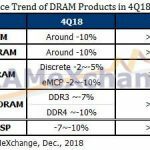 DRAMeXchange’s research director Avril Wu believes the “NAND Flash market will likely see a milder oversupply situation than initially expected for next year if major memory makers focus more of their investments on DRAM production.” As a result, the price slide for NAND flash ASPs will also become more moderate, she added. Click here for DRAMeXchange’s production capacity analysis of leading suppliers including Samsung, SK Hynix, Micron, Toshiba, Western Digital and Intel.